So, after my last post, you've come here expecting to see my shiny new skirt? Maybe even a picture of me actually twirling around in it? Meh, I thought so. Alas, I have to let you down, sewing wasn't on the cards this weekend. 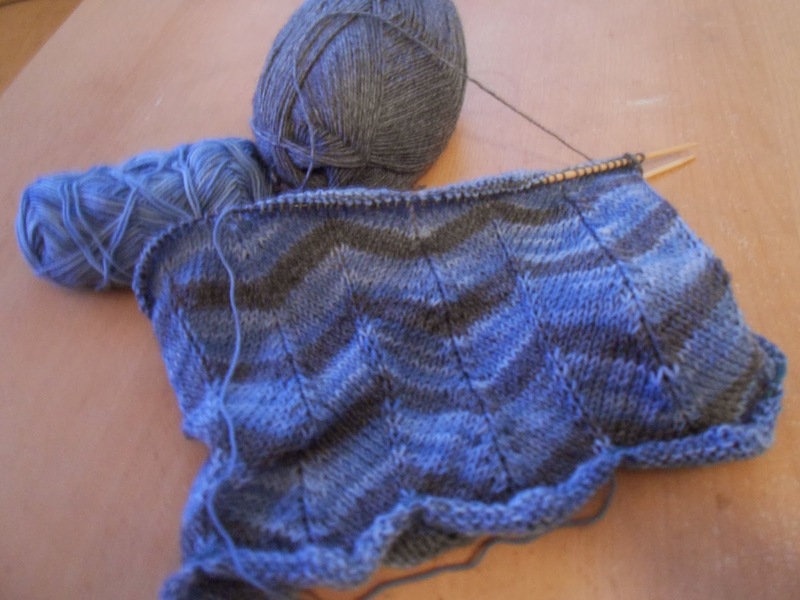 Instead I took up knitting my sister's scarf. The yarn is doing its best to drive me crazy. Well, technically that's not true but I'd rather blame the yarn than my attention span for requiring five attempts to start this thing. I kept on twisting my work when joining it in the round and only realised this after at least two rounds each. Boo. Such a waste of perfectly good time! Anyway, now that my brain the yarn's decided to behave I'm making good progress and am a little stunned how different it looks in these colours. It's been a while since I played with the grey and blue squares. 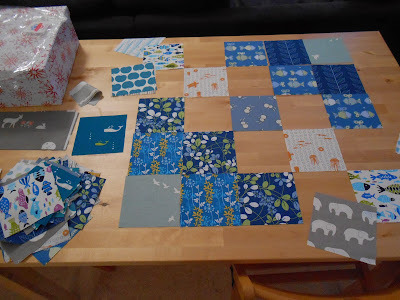 Originally I'd meant to make a second quilt for my nephew (still cute a s a button, I can assure you) but then life happened - as it does - and I struggled finishing quilt number one so I put the squares aside. However, good friends of mine are expecting their firstborn in January and this imminent arrival of another wee little boy is a great opportunity to finally turn them into something special. So I'm back to playing with the layout. In not totally unrelated news, my laptop's graphics board is playing up and keeping me offline a lot but I hope that the husband can fix it soon-ish and I'll probably catch up with you during a lunch break or two this week.